Photograph depicts two lawn chairs in front of building with front deck. Trees visible in foreground and background. Handwritten annotation on verso of photograph: "Directors Lodge Cassiar June 15 71". Building also known as "House 130". Item is part of the Cassiar Asbestos Corporation Ltd. fonds. Image is one of 20, see items 2000.1.1.3.19.78 - 2000.1.1.3.19.97. 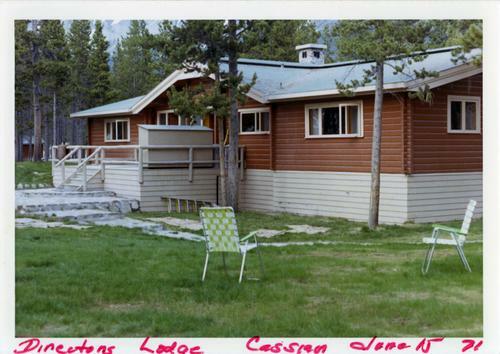 See also items 2000.1.1.4.3.8 - 2000.1.1.4.3.12 for images featuring Cassiar Directors at this building.